Can we talk Tuna Noodle Casserole? Why? Because my blog tells me people are looking for it. Particularly Meta Givens Tuna Noodle Casserole Supreme. If you don’t know Meta Givens Tuna Noodle Casserole Supreme, and you probably do, even if you don’t know you do…it’s the Tuna Noodle Casserole with the potato chips on top. I think every child growing up in the United States in the 1960’s knows that casserole! It was the bane of my childhood existence. While we probably all know or at least have had a brush of some sort with Meta Givens Tuna Noodle Casserole Supreme, like many recipes made by so many people, it kind of morphed in the passing. And so what had the potential to actually be a pretty decent dish so often turned into a hot mess. When I pulled out Mother’s worn copy of Meta Given’s Modern Encyclopedia of Cooking it was fun to see the original Tuna Noodle Casserole Supreme. Not only was there the familiar potato chip topping, but a cheese topping, too. Never being one to ruin a good potato chip, I’ve used the cheese topping. Besides chips are pricey! If I’m buying them, I’m having them with dip while watching a movie! I know many won’t agree with me, so go ahead and use the potato chip topping if you want. The biggest surprise about the recipe was there were hard-boiled eggs. I was a little horrified at first but they turned out to be the best part. I suppose they are kind of like Creamed Eggs. I highly recommend using the eggs. Tuna Noodle Casserole Supreme – gone bad! This is why I despised Tuna Casserole & didn’t eat it for 40 years! Meta used hot noodles and heated the sauce – this casserole was not mushy and the peas not overcooked because there was a shorter bake time. Meta used a 1/1 ratio of liquid to canned soup. No gloppiness here, just a beautiful, slightly creamy sauce and the peas, frozen to begin with, were bright and lovely. Meta used layers of noodles and ingredients, then poured the sauce over. The tuna stayed intact instead of disappearing and the eggs retained some integrity. Do try it with the eggs if you haven’t before – they really were the best part! Meta used a small amount of cheese – just the right amount I think, to give it a little appeal but avoid a heavy, greasy, mess. First of all, if you want to avoid canned soup, check out my recipe for just the right amount of white sauce to replace any canned soup. Start with fresh mushrooms, sauteed, then add in the flour, and maybe just a hint of thyme. A pinch of nutmeg in that sauce would never be wrong. Just sayin’. The link is at the bottom of this page. I can’t resist adding just a little splash of Sherry to this casserole if I think of it at the time I’m making it. It works whether you’re using canned soup or making your own sauce. Just a teaspoon. 🙂 So make the recipe exactly or riff a bit, but make it! You’ll love it! 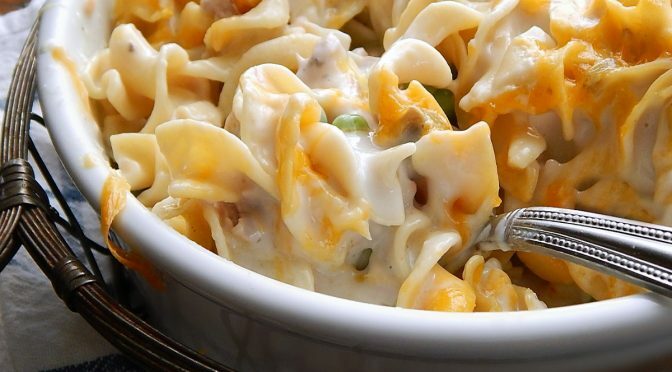 This is the definitive tuna noodle casserole so many of us grew up on; you might be surprised by just how good it can be! Drain well in a colander and rinse with hot water. Peel and slice eggs. Meanwhile, drain oil from tuna and discard. Arrange layers of noodles, sliced egg, flaked tuna and peas in a greased 6 cup casserole, beginning and ending with noodles. Heat mushroom soup (in same pan used to cook noodles) and add enough liquid from peas (or milk) to fill mushroom soup can. Let sit for several minutes and serve directly from casserole. Meta’s Note: One cup of crumbled potato chips may be substituted for the grated cheese for an unusually flavorsome topping. If casserole is not heated until bubbly, the sauce will be thin. Many recipes change up the amount of liquid. For the best casserole follow the 1:1 ratio of soup to milk and you’ll be rewarded with a casserole that has a lovely, creamy sauciness to it. Use a coupon matching site! Do not discount the savings! Every store has an enthusiastic group who will alert you not only to coupons, but the best deals at your store with or without coupons. This entry was posted in Click here for Bargain Meals, Click here for Fabulous Food Posts and tagged Bargain Meal of the Week, Casserole, Cheese, Easter Eggs, Egg Noodles, Eggs, Family Recipe, Fish and Seafood, hard-boiled eggs, Meta Given, milk, mushrooms, Pasta, Tuna, Tuna Noodle Casserole, White sauce. Bookmark the permalink. PS: The hard cooked eggs are a unique addition. We had it when I was a child and I hated it! Funny but I like it now, lol!